AAU Club Championships Ray threw a personal best in Javelin he also competed in the shot put, discus and long jump. This was Rays first big meet and he did a very good job. July 8-13 Ray finished 13 in discus today with a throw of 86'4" and threw a personal best in shot put with a throw of 23'91/4". June 26-29, 2014 Ray threw a personal best in Javelin of 38'3 finishing 1st. He also threw a personal best in discus of 87-8 finishing 1st and 2nd in shot put. June 7 & 8, 2014 Ray jumped a personal best in long jump of 13-4 and finishing 5th. He also finished 2nd idn shot put with a personal best of 23-8 and threw a personal best in discus of 70-6. Ray finished 1st in shot put and 1st in discus. He also had his first attempt at long jump finishing 4th. 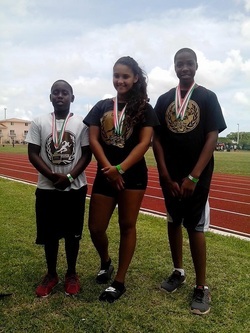 May 10, 2014 Ray competed in Another meet at North Miami Stadium. He threw a personal best of 23'3"
April 26, 2014 Ray did his first meet of the season and finished 1st in both of his events. He threw a personal best in both with a 53-1 in discus and 22-3 in shot put. Great job Ray!